CanCog Technologies has experience in image processing of all modalities. Image processing extracts quantitative data from images. This can range from basic morphometric measurements made from images such as bone length or hippocampal volume to complex segmentation based on image signal intensities. Project specific image processing routines are developed using scripts in standard software packages or can be custom developed according to the needs of the project. Interpretation of the data is routinely provided. 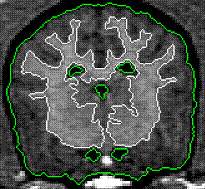 We are able to co-register images to enable low resolution quantitative images to be co-located with high resolution anatomical mages to allow accurate regions of interest to be drawn of the low resolution images. Brain images can be segmented into grey matter, white matter and cerebrospinal fluid. Regional blood flow and blood volume can be determined using either an MRI or a CT acquisition. Time activity curves can be generated from nuclear medicine studies to determine first pass kinetics.